Oh. My. Gosh. Friends, we couldn't have been more wrong! At the first game--on a beautiful and extremely chilly spring morning--Bridget spent the first ten minutes chasing the ball with the rest of her teammates. (Not bad, right?) Well...to my dismay, she quickly became bored and decided to explore the other games being played on the other fields. Which is to say, she ran away! The second game wasn't much better. She attempted to knock over an outhouse (no joke, people, she's nuts) and climb a chain link fence while her coach held a huddle. By the third game, I had concluded that maybe she wasn't as "in to it" as we had once thought. 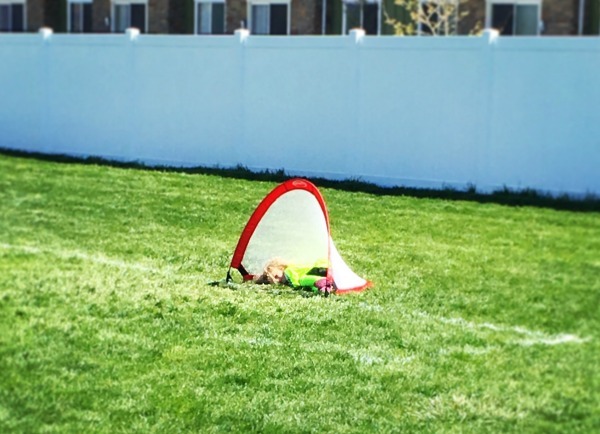 The fact that she spent the entire game sitting in the goal net, picking the grass, was a tip-off for us. But nothing was as utterly fantastic as what happened in the fourth game. There, in the dead center of the field, in the midst of the running and the kicking and the madness, Bridget decided to lie down. She dropped to her bum, fell to her back, and closed her eyes; lying as if asleep. 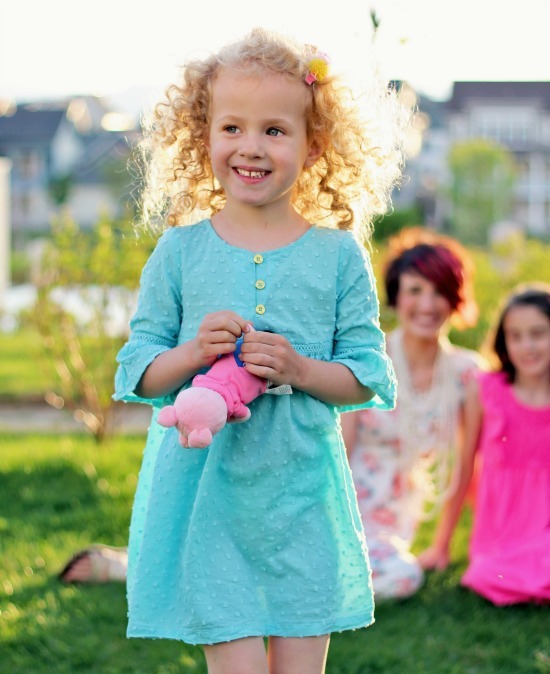 I watched as her soccer coach (a short, bald, delightfully grandfather-like man) ran over to her, grabbed her by the hand and said, "Bridget, now is not the time to play dead," before pulling her to her feet! Now is not the time to play dead. 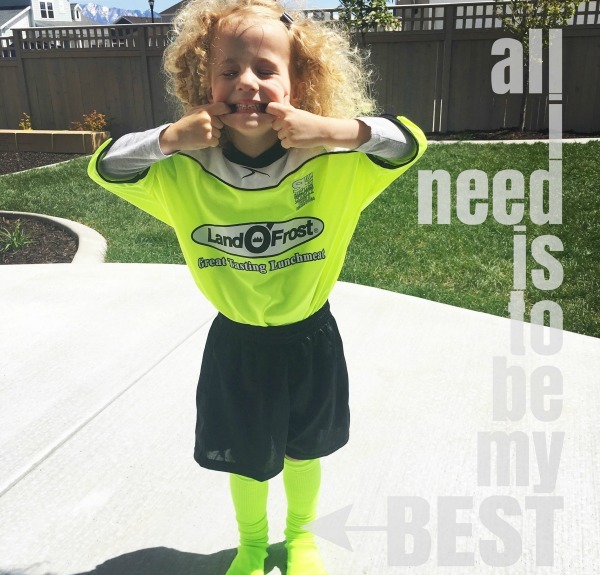 I'm in this "soccer game of life," if you will, and I'm running through a big field of responsibilities; dribbling my crazy schedule, kicking to be better and faster and stronger, attempting to raise good kids. My feet are always moving. Moving towards my goal, moving towards joy, moving past adversity and self-doubt, moving through pain, moving in exhilaration, moving, moving, moving. And boy am I often tired! Truthfully, I'd love to "play dead" sometimes. When autism rears its less-than-pretty head and my son tells me he hates me, I'd love to lie down. 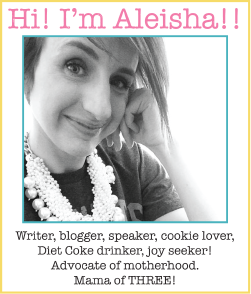 When my anxiety strikes and I worry about paying bills, being good enough, having friends, and whether or not anything I am doing is making any kind of difference in the world or in the lives of my children, I'd love to lie down. When James works late hours (and long hours) and when the children fight over stupid things, like who gets the last blue popsicle, I'd love to lie down. Because life can be really tough. And it can be hard. It can be painful. I remember when a very dear friend lost her son when he was just a baby. It was horrible and devastating, a nightmare no mother should endure. With time to grieve and a lot of support, she slowly began to face each day. One minute at a time; one step at a time. After years had passed, a woman commended my friend on her courage and resilience. She had been so brave, after all. So strong. My friend's response was exquisite. She said, "I look at it this way: what other choice do I have? I can get up each day and live my life to the fullest and try to be happy, or I can not. Honestly, I choose this path...because the alternative is too sad, too scary. It wouldn't be a life." I often think of my friend and her wise words, when the days are long and the trials are unending. I can either "play dead"--lie down in my bed and pull the covers over my head and hide from the world--or I can not. I can choose to keep running, keep moving, keep going ever-forward with the knowledge that I'm going to be blessed for my efforts. I'm going to be supported by my teammates; my loved ones, God. I'm going to be okay. Who knows, I'll probably even score a goal or two! I know I am going to win. What a great analogy! Such a needed reminder. Love you.